How did this idyllic scenario come about? 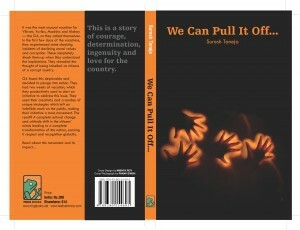 Therein lies the story of ‘We can pull it off’ by Suresh Taneja. To borrow words from Jane Austen, it is a truth universally acknowledged that a country like India that is saddled with corruption needs some big idea or person to desperately whip things into shape. A group of four teenagers in 2009 become fed up with the corruption and the related problems facing the country. They take it upon themselves to brainstorm ideas and execute them. Though the premise is very good, I found it tough at times to keep up with the vast cast of characters. We see the group of four as teenagers with their parents in 2009 and then with their families in 2030. Also the timelines flit between the past and the present at a dizzying pace. At less than 170 pages, the book is a light and fast read. It left me hoping for as bright a future for our country as vividly depicted in the book but let’s see how we actually go about achieving that status. Disclaimer: I received my copy of the book from the author. The book can be purchased here and here.